Is your about page too long and boring making people click away? Mine was. I wish I would have saved it to show you exactly what not to do. But, now its gone and good riddance! Your about page is one of the most important pieces of information you have on your blog. This single page is a first impression and you will want to craft it wisely. 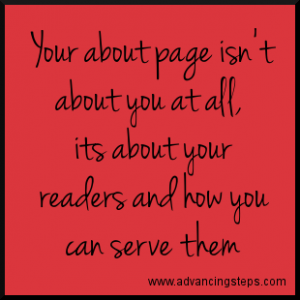 One thing to remember is your about page isn’t about you at all, its about your readers and how you can serve them. 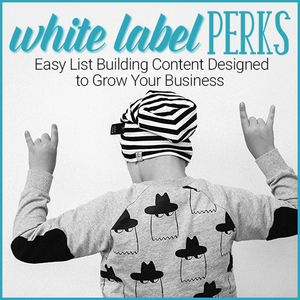 Before you write your about page you should have a clear picture of who you want to reach. Who is your target market? Define your target market and you will better understand what your market needs to know about you. My about page was entirely too long and drawn out for anyone to want to read. I wrote how I’d come to where I am today, outlining this and that. Totally unnecessary. I’m sure I lost some potential readers who had no desire to carve time out of their busy schedule for my rambling post. Since I’m fairly new to the online scene I want to work on gaining readership. With this in mind, I focused my about page on the first time reader. This is someone who’s never been to my site and knows nothing about me. I want to give them a taste of who I am and how I can help. A brief explanation of why I chose to become a solopreneur. Why readers should take time to read my site. What problems I’m facing and how the reader might learn from it. A real photo of myself. People like to see who they are reading about. Check out my new about page. People respond to realness, so be yourself. Be concise and tighten up your focus. Meaning say what you want to say with as few words as possible. There’s a really good post over at Six Revisions that covers in depth details on writing an about page, including questions to ask yourself and three different types of visitors you will have along with fantastic examples. Are you having trouble writing your own about page? If so, what is your biggest hurdle? 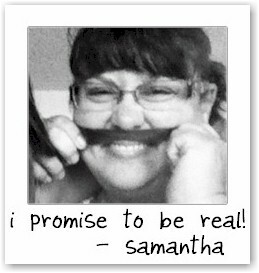 Love your tips, Samantha! I agree – a well crafted About page is a link to the creator’s intent and personality for their website. I think a lot of new visitors to a site check out the About page. I know I do. I think an effective About page — written for the reader — is a crucial and most often overlooked blog component. I know I’m always critiquing my own, trying to fine-tune it. I didn’t get to see your old one, but I have run across some horribly boring About pages, and yes — I’ve clicked away. I love yours now and love that adorable photo! Hi Mary and thank you so much! You’ve got the right idea about keeping an eye on your about page and update as needed.